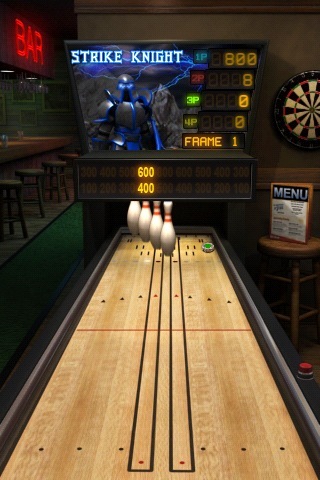 Looking for some iPhone bowling action on the cheap? Then check out the free, ad-supported Strike Knight, from the makers of Paper Toss. It’s not a traditional bowling game, but a recreation of the shuffleboard arcade bowling games of yore. I’m told they were a frequent sight in bars and pubs in the 80’s and 90’s, but I’d only ever seen a real version of this once before in a Vegas arcade. For all that, it’s still a decent little game. Instead of a regular bowling ball, you get a thick puck to launch at the pins with your finger. There is no gutter to worry about, but trying to line up a good shot is still tricky, since the touch controls aren’t quite perfect and neither is the pin action. The best I can say about the physics engine is that it is adequate, and the pin animations are rather lacking, but they all get the job done. Just like in regular bowling, you get 10 frames to bowl in, but the scoring method is a little different. Your score for a strike or a spare is timing dependent, as along the top is a score indicator that constantly cycles through and stops the minute you launch your puck. With this method, a strike could be worth 300 points or 800, depending on where the score indicator stops. I didn’t really care for this feature, but it’s possible that this was just the norm for the physical arcade games. Another holdover from the original is the setting, which looks to recreate a gritty bar or pub, complete with the Strike Knight’s blinking lights and menacing commentary and crowd sounds in the background. It’s a surprisingly nice touch and gives the game a lot more aesthetic appeal than just the game, but even with those details, it’s not the most attractive game around, especially with the constant ads emblazoned across the top of the screen. That said, it’s still pretty good for a free game. The main complaint about Strike Knight is that it doesn’t really offer much beyond the obvious. Even with leaderboards and Plus+ achievements, you’ll never get much in the way of variety, and it’s not as mindless an addiction as Paper Toss, but you can’t say you won’t get your money’s worth out of Strike Knight, and if you decide you really love it, there’s even an in-game purchase of $0.99 to get rid of the ads. All in all, Strike Knight is a pretty good deal for iPhone users. It may not be the best game around, but you don’t look a gift horse in the mouth, and Strike Knight is a worthy temporary diversion. AppSafari review of Strike Knight was written by Tracy Yonemoto on June 1st, 2010 and categorized under Action, App Store, Free, Games, Physics Based, Sports. Page viewed 4974 times, 1 so far today. Need help on using these apps? Please read the Help Page.